Dollhouses, Trains & More will once again host the Pocket Party Classes in 2018. The classes are scheduled for the 3rd Saturday of the month unless otherwise noted. The first Pocket Party Class is scheduled for Saturday, January 20th, 2018 from 10AM to 1PM. This class draws its inspiration from the tiny figures used in the Train Department. While researching on the internet, Maria Creasey discovered a whole world using these tiny figures. She used the search term, “tiny people world” and there they were. WOW! “Tiny World Terrariums” and of course Pinterest for Mini People. Inspiration for the first Pocket Party class. The cost of the first Pocket Party Class is $25.00. Please bring your own tweezers and magnification glasses. All other supplies will be provided. Class space is limited. You must reserve a space to attend. NO Drop-ins. To reserve your space, please call the Miniature Dept. at (415) 883-0388 Ex.106 or email. Bring a dish to share and treasures to sell. Pre-Registered $6. Pay at the door $8. For more info, contact Ruth Heisch. The Mini Cyber Club is an online club that is conducting workshops, seminars, and other activities via their website and video meeting rooms. Membership in the Mini Cyber Club is free, and is open to NAME members who want to be part of a dollhouse miniatures club, and Non-NAME member guests to get an idea of what NAME is all about. Check out the calendar on the N-2 website for a schedule of online and N-2 Region events. December 4 – 9 MCC Auction to fund programs and shipping expenses. Also to help NAME. Find out more about the Mini Cyber Club. Construct and solder a slatted metal/wood table and chair for the outdoor garden of the porch. Cost $25. Construct the main body of the porch, stairs, windows, etc. Cost $45. Make many accessories for the garden such as containers, vines, plants, succulents and flowers. Cost $30. The workshops will take place at M&L Precision, 18665 Madrone Parkway, Morgan Hill, California. Bring a basic tool box and a sack lunch. A beverage will be provided. Register early. Some classes may be limited. No kits available. For more information and to register, contact Ruth Heisch. Use this box to add items of your choice to create a holiday scene. A photo of the finished piece will be displayed online and in the Gazette. The Mini Cyber Club is for NAME members who want to be part of a Dollhouse Miniatures Club, and Non-NAME member guests to get an idea of what NAME is all about. All activities take place online. Finally, a club for NAME members who are not able to attend a club in their area! The Mini Cyber Club does not have annual membership fees. This month, the club is hosting a holiday ornament contest or a trash to treasures contest. The event takes place online Nov. 1-28, 2017. For more information and to make reservations, visit the Mini Cyber Club website. The former Stockton Miniature Show has had to change locations due to the hall closing. The event has moved to the Lodi wine country. One paid admission for both shows: adults $7.00; children under 12 are free. Ask for Lodi Miniature Show rates. Book by 5/1/2018 to secure the room rate. The rate is available June 29th and/or June 30th. For dealer contract and information, contact Leslie Flint. Bring your “real estate” and sell it on Real Estate Row $20.00 (free for vendors). For more information, visit miniaturesonthewaterfront.com, or contact Leslie Flint or Debbie Heard. Registration opens Oct. 27, 2017 for Jockeys and Juleps All-Scales Houseparty. The event will be held May 18-20, 2018, in Louisville, Kentucky. Workshops, theme luncheons, and the dealer list is available on the NAME website. Download a houseparty registration form. (408) 453-4000 or make reservations online. Adults $7, Seniors (62+) $5, Children (5-12) $3, Children under 5 free (no strollers please). Free Door Prizes. A special children’s drawing each day. The show is a benefit for the PlaneTree Health Library. For more show information, visit the Good Sam Show website. Join us for exciting workshops on Friday, October 6th, featuring prominent teachers from all over the country. Friday Workshops are held at the hotel. Workshop registration is now open. View the workshops. Now you can be a doll in your own miniature room. Holodeck 3D Studios will scan and print you in 3D. 1:12 custom scaled. Dress in your favorite outfit to match your room. Shop with 100 dealers featuring artisans from all over the country and several international dealers, including a number of IGMA Artisans and Fellows! You’ll find everything you need to finish that special miniature project including dollhouses, room boxes, unique furniture, beautiful dolls, food that looks good enough to eat, holiday items and much more. See the dealer list. Unique and one-of-a-kind exhibits on display outside the sales floor. First-time and long-time exhibitors are strongly encouraged to bring their room boxes, structures and unusual containers to share in 2017. Children can make a miniature project of their very own at our free Children’s Workshops Saturday and Sunday from Noon until 3 pm. They can try building, landscaping, or soar with their imagination before going over to the Children’s Sales Table where we have priced miniature items for a child’s budget. Tickets will be on sale for the Dealer Donation Drawings to be held Sunday at 3:15 pm. You do not need to be present to win. The Silent Auction will be Saturday, October 7th from 10 am to 2 pm There will be wonderful miniatures to bid on. Bid early, bid often. We have special classes for children at the show on Saturday. Children must be pre-registered for these classes. Workshop registration is now open. View the Children’s workshops. Sunday, October 8th from 9:30 am to 10:50 am we will have a FREE “Tools and Techniques” seminar for all. It is held at the show venue and will cover a number of power and hand tools, as well as information on roofing, flooring, wall treatments, basic landscaping, and other aspects of making miniatures. Please join us. Our spectacular dealers donate items to a special Dealer Donation Drawing. Tickets may be purchased at the show and winners will be drawn Sunday at 3:15pm. You do not need to be present to win. The Good Sam Academy of Miniatures offers multi-day classes taught by miniaturists that are leaders in their selected fields and have been teaching their skills to miniaturists for several years. Classes will take place immediately after the 2017 Good Sam Show. Academy registration is now open. View the Academy class listing. The Smithsonian Museum in Washington D.C. is refurbishing dollhouse death scenes that were used for forensic science. The exhibition, “Murder Is Her Hobby: Frances Glessner Lee and the Nutshell Studies of Unexplained Death,” will be on display from Oct. 20 to Jan. 28, 2018. Visitors will be given flashlights and magnifying glasses to inspect the 19 dioramas. More info about the restoration process and the exhibition. There are many NAME members who do not have access to a club nearby or cannot travel to share their love of miniatures. For that reason, the Mini Cyber Club was created. It’s an online club with is own website and a chatroom. A full team of organizers laid out a plan to include lots of activities like any other club. The club’s digital doors are open to NAME members and guests. The guests have a 90-day grace period to join NAME and participate in the NAME sponsored activities like NAME Day, houseparties, conventions, Hallmark contests, etc. Free seminars and workshops are planned for the club (like any other club) and quarterly live meetings will help the members get to know each other. The team that manages the club is made up of seasoned veterans of NAME. For a list of the team members, visit the club website. You may join the website and Yahoo group here. Fill in the form and submit it. In a day or so, you will be invited to join the group and be given a link. Be sure to use that link right away so the the invitation does not expire. So far, the club has had an auction, two free seminars (one on making mods and one on using the molds to make the parts) with more to come. See the current activities. Visit as a guest or become a member of the online club. The Good Sam Show is offering free workshops for little children and pre-registered workshops for children ages 9 to 14. The free children’s workshops will take place Saturday and Sunday (Oct. 7-8, 2017) from noon until 3 pm at the Doubletree Hotel in San Jose. These workshops are for children under age eight. Good Sam is offering three special workshops for children over the age of eight. The children’s pre-registered workshops will be Sat, Oct 7th, 2017. Registration is open. Class space is limited so be sure to sign up soon. The registration deadline is September 15, 2017. List of pre-registered workshops and registration form. For more information, please contact Lynne Hoffman. 100% of the proceeds from the raffles and the auction will go to Childrens Hospital Oakland. Two workshops will be offered on Sunday. More info and sign up are available on the CHAMPS Show website. Classes to be held Monday, October 9, 2017. The Good Sam Academy of Miniatures offers classes taught by miniaturists that are leaders in their selected fields and have been teaching their skills to miniaturists for several years. Classes take place immediately after the 2017 Good Sam Show, in Morgan Hill, California. Download the Registration Form Registration deadline is September 1, 2017. Jim Larson Designs presents a delightful and practical miniature that is sure to enhance any collection. This lighted, charming half inch tissue box features a tissue rising from its chimney, masquerading as a puff of smoke. It is of basic construction for students of varied skill levels and to be decorated to the builder’s personal taste. Shingles, windows and door make it a treasure to display anywhere in the home. Scale: 1:12th (1-inch scale)Skill Level: Some experience to skilled. We will be building from scratch an exact 1/12th scale copy of one of the most often ordered piece in my line. This is a most unusual piece yet one that almost everyone recognizes as having been in grandma’s kitchen or back porch. Also sometimes known as a Houser table, this table was a very popular kitchen fixture until the advent of commercial bakeries. This is a copy of a beautifully functional antique that will bring smiles to your heart. Its natural pine finish and real metal bins add to the fantasy. Even the drawer handles are specially cast, made to the original specs. The bins are aged and dented tin and the bread boards are scarred from decades of use. Many of the primary wood elements are pre-cut and all assembly is straight forward under your experienced instructor’s supervision. All parts are included and the student will leave the class with a treasured finished product. The student should be familiar with using the basic tools of miniature building. No power tools will be used. Students will learn creative assembling secrets and the basis of the renowned Shaker Works West finishing process as well as many other tricks of the trade. More information about the classes. This is the last opportunity to sign up for NAME Day with MiniCals and Through the Looking Glass. MiniCals & Through the Looking Glass will host a one inch scale event at M & L Precision, 18665 Madrone Parkway, Morgan Hill. The armoire for the backwoods bunks is a storage space for outdoor and sports fun. Lots of accessories for an armoire to accompany the bunk beds or stand alone. Gifts, auction, exhibits, shoebox sales, food and fun! Bring a tool kit and jig. Cost $45. Contact Ruth Heisch. The Itty Bittie Miniature Club has installed an exhibit of miniatures at the Community Library in Winters, California. The exhibit will be available for viewing until August 30, 2017. Winters is located west of Davis and north of Vacaville on I-505. If you can make it, please leave a comment at the front desk. Nell Corkin, Co-Chair of Miniature Masterworks, has provided the following information about the upcoming show. For more information/questions, please contact Nell. Miniature Masterworks will be a miniature show unlike any other! You don’t have to be a member of IGMA to attend, and we hope our friends from NAME will join us. This one time only, special event juried show will be held inside the beautiful National Museum of Toys and Miniatures, which has one of the best collections of fine scale miniatures anywhere. Participating artists will be giving talks about their works on display in the museum on Saturday and Sunday. Over 60 artists from around the world will be participating, including some who have never done a show before, some who seldom or never do shows, and some who are coming out of retirement just for this show. See the list of artists. A highlight of the show will be The Barbara Marshall Award for Artistic Achievement, sponsored by the National Museum of Toys and Miniatures. It will honor miniatures artists whose work exceeds the current standards of fine-scale miniature making. All artists participating in Miniature Masterworks may enter one piece. Prizes will be awarded for first place ($15,000), second place ($10,000) and third place ($5,000). All pieces entered must be for sale, and all will be on display at the show all weekend. This is the first time awards of this kind have been offered at a miniatures show in the United States. Don’t miss this chance to see some truly incredible works of miniature art! A wide variety of wonderful miniatures, in every price range, will be available for sale all weekend. Following the show on Sunday, September 17, there will be an open house from 6-10 PM at the home and studio of Bill Robertson, which is near the museum. All are welcome. Bill’s shop is just as amazing as his work! Details and a map will be available at the show. For more information about any aspect of the show, travel information for Kansas City, or to buy preview tickets, visit the Miniature Masterworks page. Workshop on Sunday, Sept. 10. Dana Burton of MiniatureArt will teach a Mini Doll Workshop on Sept. 10, 2017. More info and signup. 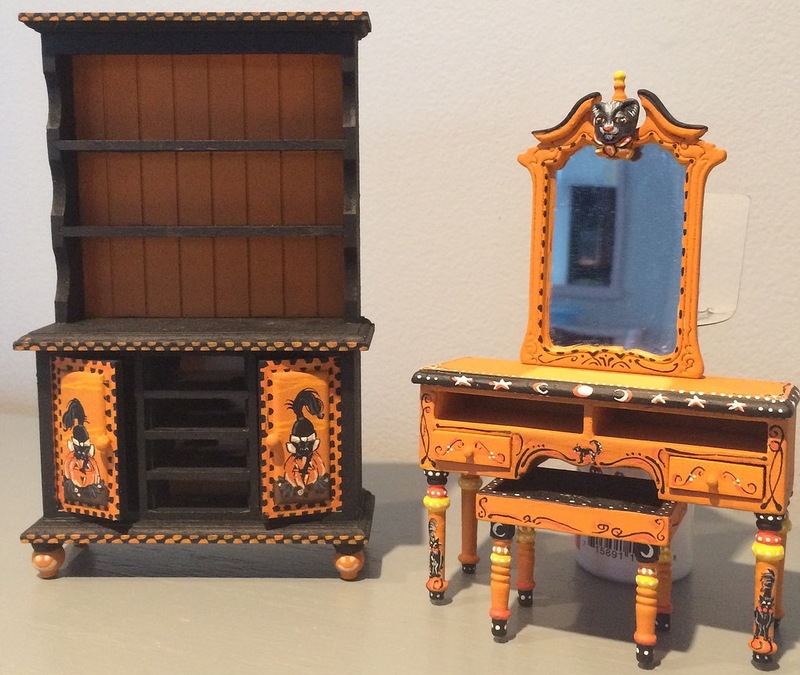 Jil Weisz will teach a Halloween hutch and vanity workshop. More info. A tree house contest will take place during the show. Register to take part in the contest. Visit the CHAMPS Show website for more info. This year’s NAME Day event is “BEDROOM – PART II: The Armoire.” Plans for the armoire are provided in various scales in the NAME Gazette. Some kit cutters will produce kits for 1/144” scale. This armoire has been designed to coordinate with the bunk beds from 2016. The bunk bed kits will also be available this year. In 2018, the final piece for this room will be available. Please see below for various event dates. Kit-bashed armoire by JP Sligh. To participate in NAME Day, contact one of the N2 region members who are hosting an event (below). If you are unable to attend a local event, kits are available to order (click on “2017 NAME Day Cutters”). Online events are also happening (see below). October 21, 2017, 9am – 11am PT, 10AM – 12pm MT, 11AM – 1pm CT Time, 12pm – 2pm ET. Live workshop instructions for NAME Members Only. Assembly time and then party time. Live assembly instructions, virtual champagne brunch, actual exhibits, actual door prize, games, challenges, auction. Register online. October 14th and 15th. Registration has closed. Payment is due July 31. More information about the NAME Day project is available on the NAME website. The Kiwanis Club of Carmichael, CA, is looking for people who would like to display their fairy house creations and talk to people about their hobby. On the second Saturday of each month, the Kiwanis Club opens the Koobs Nature Area (a 5 acre nature preserve in Carmichael) to the public with hands-on activities for families. Each month is a different theme. On August 12, 2017, the theme will be fairy houses. For more information and to display your fairy house creation(s) on August 12, please contact Jenny Hawley. Visit the Koobs Nature Area on Facebook. Pixie Gypsy Caravan inspiration by artist Nichola Battilana of blog.pixiehill.com. Suitcase Fairy Garden inspiration by empressofdirt via eBay.com. The 24th Annual Summer at Tahoe State Day Workshop will be held August 5, 2017. The event is sponsored by the Tahoe Miniacs. The theme is “The Getaway”. Commune with nature and get away from you daily routine. A romantic hideaway! Cost: $65. Includes: project, breakfast, lunch, gifts and more. Contact Mary Ann Van Buskirk for more info: 530-541-0891. Peggy Pucket, long time Good Sam Show dealer, invites miniaturists to come and browse her large inventory of miniatures. All inventory will be on sale. Come early for the best selection. Dealers welcome! Please bring a table. Peg Pucket will be hosting her annual miniatures sale. Don’t miss the 6th Annual Stockton Miniatures Show and Sale presented by Miniatures on the Waterfront. Dealers and dollhouse enthusiasts will be selling: dollhouses, furniture, accessories, electrical and lighting. Raffle. Find everything you need to start or finish that special miniature project. Admission: $6.00 at the door; $3.00 children 12 and under. Lucy Hanson will be doing a FREE LED lighting seminar. For accommodations, call the University Plaza Waterfront Hotel. 877-957-2378 or 209-323-3057). Other hotel options are available. For more information, email Leslie Flint or visit the Miniatures on the Waterfront website. The Smallsea Collection auction will be an online auction hosted by Alderfer Auctions in association with Eileen Rhoads. It will run from July 8 to July 22. The Smallsea Museum Collection was amassed over the last 25 years. It includes dollhouse shops and town structures, furniture, accessories, dollhouse dolls, and other 1:12 scale miniatures created by hundreds of international artists both from the present and years gone by. Smallsea Circus, Summer Fair and Town Hall Christmas amusement and concession stalls, market vendor stalls and carts, an ice skating rink, skate shop and Christmas Emporium and market stall. Photos, auction info and registration is available online. Joanne Martin, President of the Miniature Museum of Greater St. Louis, is the subject of a new film, “Joanne Martin: A Life in Miniature”. The film is in the final stages of development before being submitted to film festivals in the latter half of 2017 and 2018. The film is being directed by Joanne’s niece, Stephanie Lewis. Stephanie hopes that the film will be a catalyst to excite interest in the world of miniature-making. It’s also a special film about a special woman. Here is the trailer. The MiniCal’s June workshop is a wonderful little shop with a back porch. Participants will complete the exterior, porch and lighting during the class. Designed and taught by MiniCal’s member, Karen Laisure. 1″ scale Raggedy Ann in a trunk. Workshop by Deb Laue. MiniCals have been so thrilled to have so many great folks enjoying our workshops. Our original intent was to be able to save some of the monies to hire guest teachers or subsidize classes for you. Our club voted to do just that for our May workshop as a “thank you ” to our supporters and any Newbies who would like to attend our Morgan Hill class on Saturday, May 20. Join Deb Laue in the wonderful world of Raggedy Ann as we assemble a tiny doll in a 1-3/4” high trunk. Dress a porcelain doll in special printed fabric that is scaled just right for the doll then create a trunk decorated just for her. Top it off with a special hat. The MiniCals is offering this class for $40, a great price for our mini friends. Please signup before May 1, 2017. Email Ruth Heisch. Rev Up Your Engines…All For the Love of NAME! It’s the 2017 “Soapbox Derby”! For a $25 donation, you will receive a “Soapbox Racer” kit in your choice of sizes (display box not included). You will be getting these early this year, so you will have time to build, glue, sand, construct, paint, stain, bling…whatever you would like to do. Then, you may post your lovelies on the NAME Facebook page, or on the NAME website, or both. Share your talent with everyone! There will be great prizes again this year, and we will again have a prize for the person whose racer finishes dead last. So don’t say I can’t play because I always lose, because as a loser, you could be a winner! The winners will be drawn on Sunday, May 28, 2017, which just happens to coincide with the running of the Indianapolis 500, a different race but a race none the less. If you have questions please contact Kim Wood. Remember, there is nothing wrong with buying an entire fleet or stable of racers; this just ups your odds of winning. One entrant’s design of their soapbox derby car. The Legend of Sleepy Hollow is the theme for the 2017 NAME Small Scale Regional Housparty. The event will be held Sept. 21-24, in Scranton, Pennsylvania. Registration opens April 14, 2017. View workshops, theme luncheons and more. Read the Miniature Gazette online. Issues from the past two years are available to logged in NAME members. Issues older than two years are available to everyone. 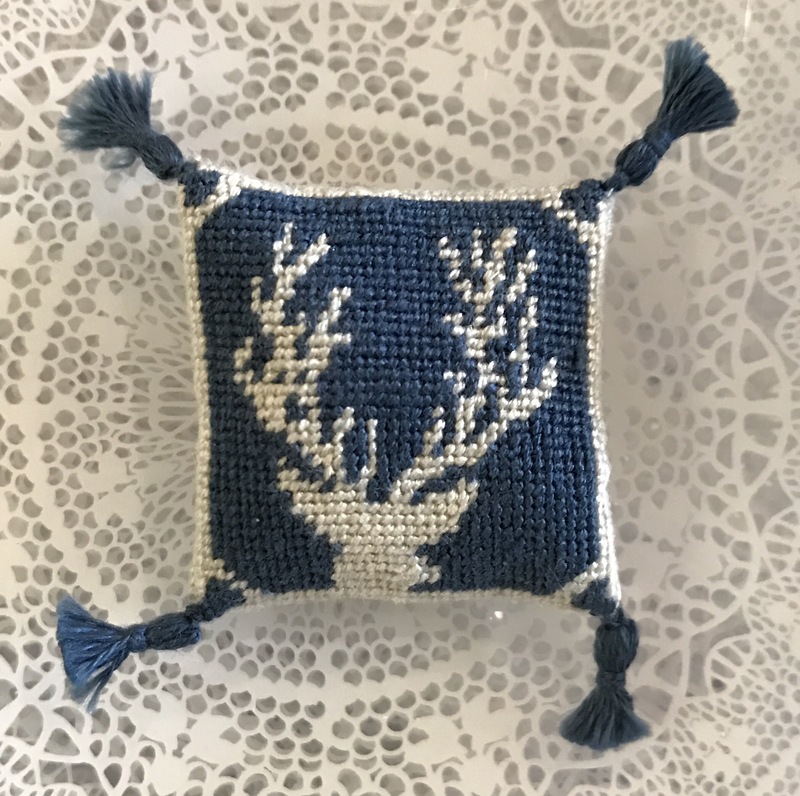 Hong will be showing participants how to stitch this needlepoint pillow in their choice of colors. 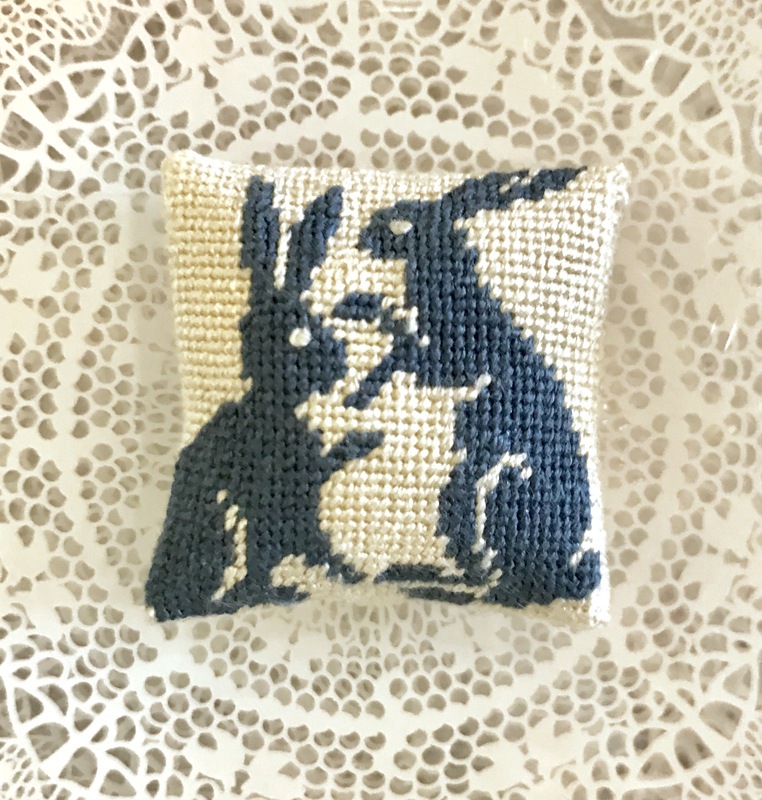 Join the MiniCals as Hong McKinsey will teach a 1″ scale needlepoint rabbit pillow workshop. Everyone is invited. Cost $25. Contact Ruth Heisch for more information. Workshop participants will receive the pattern to create this pillow at home. The purpose of NAME Day is to unite and involve all NAME members by doing the same project on the same day at different locations throughout the US and internationally. 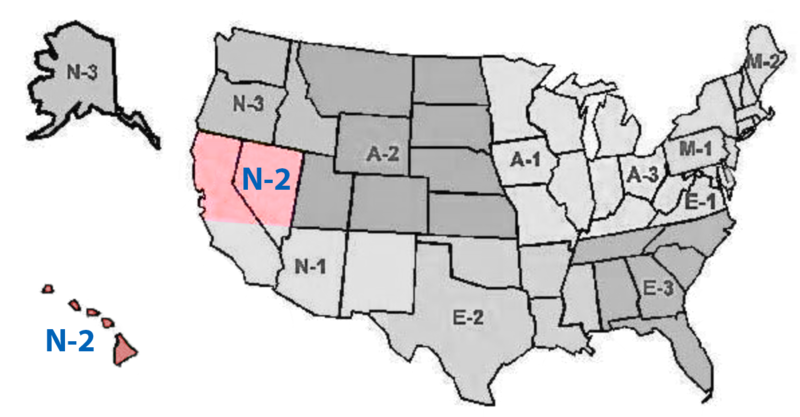 Participation in an event may occur in clubs, locally, statewide, regionally, or online. NAME Day will take place on Saturday, October 7, 2017. Expanded events (or areas with conflicting dates) should occur as close to this date as is reasonably possible. Project: All events will center on the same project – “BEDROOM – PART II: The Armoire”. Plans for the armoire will be provided in 1”, 1⁄2” and 1⁄4” scale as soon as they are available. Some cutters will produce kits for 1/144” scale. This armoire has been designed to coordinate with the bunk beds from 2016. The bunk bed kits will also be available this year. In 2018, the final piece for this room will be available. More info is available on the NAME website. Are you organizing an event for NAME Day? Let Ruth Heisch know the details so that your event can be listed in the Gazette, on the NAME website, and on the N2 Region’s website. Email Ruth. Official deadline for ordering from the cutters. However cutters may opt to accept orders later. Watch the listings in the Gazette for individual deadlines. Date when the cutters can ship the kits. International shipping dates may be earlier. Some groups may set a later date to accommodate other considerations. More information about NAME Day in the N2 Region will be posted as it becomes available. Please share your photos from the Sacramento houseparty. Many of our Members were unable to attend the NAME event and may enjoy seeing the wonderful exhibits, photos from workshops, friends having fun, centerpieces, etc. Please email your photos so that they may be distributed through the N2 website and the N2 newsletter. Our “Mini Learning Center” Hospitality Room will be open to Registrants of the Sacramento Houseparty. Want to know what a wonderfully fun hospitality room looks and feels like? Then, come on down. We look forward to welcoming you and providing a friendly, comfortable atmosphere where you can just sit back, relax and visit with old friends and new. Maybe you would like to learn one of the various techniques we’ll be demonstrating? Each day, we will feature another exciting demo. We want to offer each guest the opportunity to roll up her/his sleeves, sit down and join in on the fun. Scattered throughout the room, you’ll find make-it and take-it stations set up with different projects for your amusement. Or, if you don’t have much time, just peek-in and check out our how-to storyboards, watch a video, or browse through our helpful book collection. We encourage one and all to stop by and enhance your mini making abilities! Hospitality Room hours will be posted at the houseparty. Please help NAME to recognize people who give their time and energy to support our region. There are six categories for nominations (explained here). Not registered for the NAME Sacramento Houseparty? You may still visit the Sales Room with vendors from around the country. Many wonderful exhibits will still be there for you to see, and a small Make ’n Take activity will be in the lobby outside of the salesroom. Join us on the lower level in the California Ballroom. Parking: $4.00/day. Park to the left of the main part of the hotel and enter through the side door on the lower level. Free admission to the Exhibit room and Sales room. Contact Barbara Thornton-Hill for more information. The MiniCals Flea Market and Potluck is coming up on March 18. Clean out your stash to make room for new minis that will be be available at the Sacramento Houseparty. Sales tables are available. Bring a dish to pass. Door prizes. Prepaid tickets $6. Tickets at the door $8. Contact Ruth Heisch for more info. Join Dana Burton of Miniature Art for her live class! A sealed bid auction of wonderful room boxes are being donated by Joan Kunzel, a member of MiniDreamers. All proceeds from the auction and show will go to Childrens Hospital Oakland. Visit the new CHAMPS Show website. Terezinha Justino is taking over the CHAMPS Show. Diane Walter will be working with Terezinha during the transition year. Alcohol inks create interesting patterns on mini dishes. A new mini project has been posted on the NAME Special Events page. Jane Sanem has provided instructions for creating interesting patterns and effects on miniature dishes using alcohol inks. Read the tutorial here. The instructions are based on NAME Region A1 Regional Coordinator, Barbara Anderson’s workshop. Jane Sanem is offering a giveaway. Jane is having a giveaway. If you would like to take part in the drawing, email Jane, and put “Alcohol Ink” in the subject line. The deadline to enter your name in the drawing is March 20th, 2017. Supplies needed for the project. Looking for dishes to use alcohol inks on? Factory Direct Craft is offering a 15% discount on all purchases. They offer white porcelain platers, bowls, teapots, etc. The 15% discount is good through May 21, 2017. Enter MINIATURES as the coupon code to receive the discount. The National Association of Miniature Enthusiasts will hold their national convention July 27-30, 2017, in Alexandria, Virginia. The week will feature dollhouse exhibits, miniature-making workshops, and a vendor salesroom. Registration is now open for the NAME 2017 National Convention. View the dealer, workshop, and theme luncheon lists. When: Saturday, February 18th from 10 AM – 1 PM. Two Under Glass Dome projects will be made during class. The first will be the mini Under Glass Dome project shown below. Participants will be provided with everything needed to make this for a 1″ scale dollhouse. The second Under Glass Dome project display will be up to each student’s imagination to fill. This glass dome is 3 1/4″ tall at the center, and 2 1/2″ tall on the outside. The glass dome base diameter is 1 3/4″. The glass dome sits on a wood base. Students are encouraged to bring the item(s) which will be placed in the dome. Participants are asked to bring tweezers and magnification glasses. All other supplies will be provided. Class space is limited. Reservations required. NO Drop-ins. send an email. More info is available on Dollhouses, Trains and More website. TLS1 – The Antique Dolls’ Houses and Miniature Structures of Moritz Gottschalk by Lew Kummerow $130.50 Moritz Gottschalk was one of the more prolific of the early toy makers, and his business was one of the most long lasting companies. He created nu- merous small structures including dolls’ houses, stables, kitchens, shops and other unusual items that were representative of the changing periods from the late 1800’s to WWII. Today his antique pieces can be seen in museums and are also part of many private collections. Each attendee will receive a miniature of one of Gottschalk’s rarer pieces. TLS2 – Powering Your Miniatures with LED by Luci Hanson $80.50 Now that LED has been around a while many are ready to learn about what can be done with it and how they can apply it to their homes, rooms and displays. Join Luci as she shares how to mix LED lighting with the olds style lighting. Learn about the latest innovations and supplies that are availa- ble to use in miniature displays and dollhouses. Learn how to convert some of your old lamps and lighting to LED lighting. Luci will also share with you how to adapt some of the old style components with LED lighting. You will receive a 9-volt power system, a 3-volt power system, a 12-volt power system and lights to go with each system as a gift for attending. TLS3 – ABC’s of Small Scale Food by Janet Smith $85.50 Come hear about the ABC’s of making small scale foods. We’ll discuss different clays, paints, glues, tools, materials, etc. Go home with a quarter scale replica of a luncheon based on the actual luncheon for the day as well as a printed booklet with all the information covered during the luncheon. You will receive a quarter scale luncheon based on the actual luncheon menu that you will be served. TLS4 – Capturing Your Miniatures Using Photography & 3D Scanning by Ruth & Dan Stewart $114.50 Explore your world of capturing miniatures with us. Learn about ways to improve your photographs and explore new methods of capturing or creating your miniatures in 3D. Questions are encouraged so bring your list! You will have a choice of a 1” or 1⁄4” 3D special made item you won’t want to miss! To attend the Theme Luncheons, participants must be registered for the NAME Sacramento Houseparty. More info and houseparty registration. Download the Theme Luncheon Registration form.